Old Abe the War Eagle, became a trademark of Wisconsin’s Civil War history during his service with 8th Wisconsin Infantry throughout the war. Old Abe and the 8th Wisconsin Infantry trained at Camp Randall in Madison. Old Abe served as a mascot throughout the Civil War, and his legacy lives on through the screaming eagle insignia of the U.S. Army’s 101st Airborne Division. In the year of 1861, Ahgamahwegezhig translated as ‘Chief Big Sky’, of the Flambeau Band of the Ojibwe Indians, rescued the eagle known as Old Abe from a nest they discovered in a tree they had fell. As Chief Big Sky traveled down the Flambeau River, he traded the eaglet to a family by the name of McCann, of Chippewa County, for a bushel of corn. The Eaglet became a McCann, and was treated as a family pet, until it began to mature and grow to be much more of a burden than the McCann’s could handle. 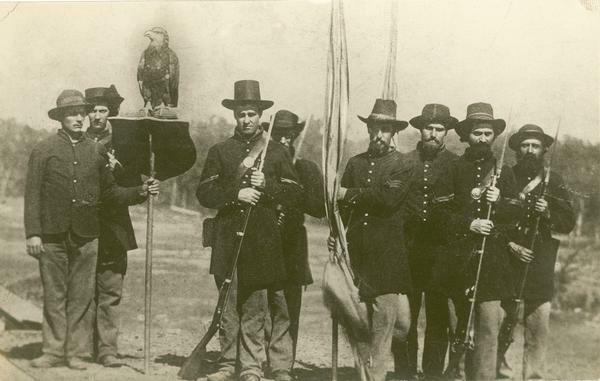 During the time period of 1861, President Lincoln began recruiting, and moving troops for the Civil War, and the McCann family transported the young eagle to Eau Claire where the 8th Wisconsin Infantry had been participating in the recruiting process. It was here that Captain John E. Perkins, of the 8th Infantry, purchased the young eagle as a mascot for his regiment, for the price of $2.50. Perkins justified his purchase to the men as “it is the eagle of freedom, the bird of our banner” (Fitzpatrick 2001, 19). Perkins named the newest member of his unit Old Abe, in honor of President Abraham Lincoln. Shortly after the transaction, the 8th Wisconsin and Old Abe ventured on to Camp Randall in Madison, Wisconsin, for further training. The 8th Wisconsin Infantry organized and trained at Camp Randall in 1861, was mustered into service on September 13, 1861, and left for duty in St. Louis, Missouri on October 12, 1861. This was not however before the men of the 8th swore Old Abe in as their mascot, and a specialized perch was designed for him, with a shield and a length of chain, preventing him from flying away. Not long after, the 8th became known as the Eagle Regiment. Though the 8th left to join the war in October 12, 1861, it was not long after that Abe and the men saw combat, on October 21, 1861, at Fredericktown, Missouri. Throughout the length of this battle, Abe was kept at the back of the troops, and was said to have been screeching loudly throughout. This would be only the first of many battles for them however. Throughout Old Abe’s service, he was present for 37 battles and conflicts including Vicksburg. “Col. Rufus Dawes of the Iron Brigade recalled, ‘Our eagle usually accompanied us on the bloody field, and I heard [Confederate] prisoners say they would have given more to capture the eagle of the Eighth Wisconsin, than to take a whole brigade of men’” (McLain 1925, 1). After nearly four years of service, the 8th Wisconsin Infantry was mustered out of service at Demopolis, Alabama on September 5, 1865. Throughout the unit’s service there were 280 men lost during their service. Six officers and 53 enlisted men were killed during service, and two officers and 219 enlisted men died from disease. Estabrook, Charles. “8th Wisconsin Infantry History.” Wisconsin Historical Society. N.p., 27 Aug. 2012. Web. McLain, David. “The Story of Old Abe.” The Wisconsin Magazine of History, vol. 8, no. 4 (1925): 407-414. Web. Quier, Edwin Bentley. 8th Infantry, Chapter 16 from E.B. Quiner’s Military History of Wisconsin (Chicago, 1866). N.p. : Clarke, 1866. Print. Zeitlin, Richard. “Old Abe, the War Eagle.” Wisconsin Historical Society. N.p., 03 Oct. 2012. Web.